Sweet Potato Casseroles are usually absolutely loaded with butter, milk, or even coconut oil, which is simply one thing… a lot of FAT! Oh and let’s not forget the traditional topping either! I think if I see one more casserole with a marshmallow top I’ll scream. Can you say processed sugar AND gelatin? No, I knew from the beginning I wanted something different. And after that very first taste, well let me tell you something right now…. THIS is the Sweet Potato Casserole you want to make this Holiday Season! Not too sweet, absolutely no butter or oil, and a crispy, crunchy topping made from healthy rolled oats and pistachios. Traditionally, pecans are used to make all kinds of holiday toppings, if not an entire pie. And ounce for ounce, pistachios are way healthier. For starters, they have a bit more fiber, over 3x the potassium, twice the protein, less calories, and a lot less fat! It’s the same when you compare them to walnuts too, another holiday favorite. Less calories, less fat, and a whole lot more of the good stuff. So it was really a no brainer to use pistachios for this casserole compared to any other nut. 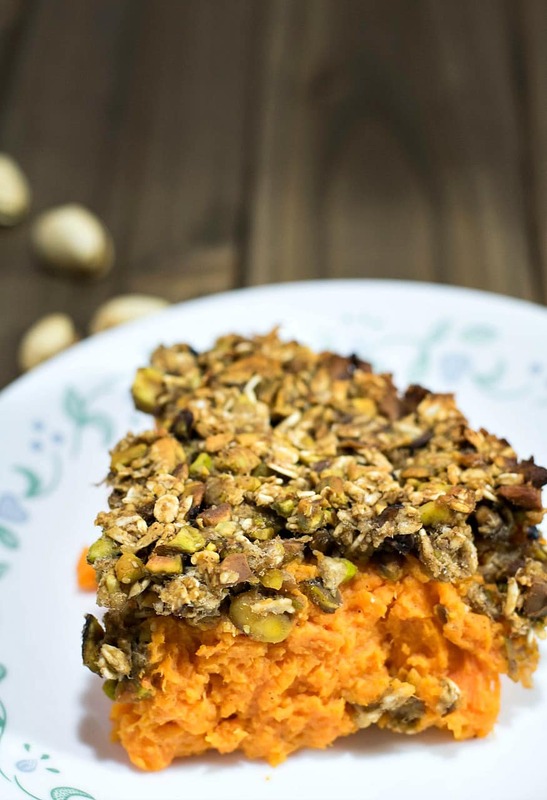 And trust me, when you mix the salty crunch of pistachios with the creamy sweetness of sweet potatoes………. ah it’s a match made in heaven. And besides…..I just happen to love Pistachios. Of course some people are going to have nut allergies, or will want an absolutely zero fat recipe. In this case you could simply double the oats or leave the topping off completely. Another idea would be to place sliced bananas on top and then sprinkle with oats. Regardless, I think it’s time I quit yammering and get on with the recipe…..right? So without any further ado…..I give you my Vegan Sweet Potato Casserole. Start off my peeling and cubing 5 large Sweet Potatoes. And by Sweet Potato I mean the Red ones (YAMS) not the white ones. Remember to make the cubes about the same size so they cook evenly. Add these to a large pot of cold water and give it a generous pinch of salt. Heat the potatoes on high just until they come to a boil, and then let them cook for 10 minutes. Remove from heat, drain, and then return the potatoes back into the pot. In a small measuring cup, add ¼ cup Unsweetened Almond Milk and 1 tsp Lemon Juice and mix well. Then add ½ tsp Salt, ½ tsp Cinnamon, ½ tsp Vanilla, and 1/8 tsp Nutmeg. Mix well with a whisk and then pour this into the pot with the potatoes. Mash until smooth and creamy. Spoon the mashed Sweet Potatoes into a large casserole dish and smooth out the top. Set aside for now. Roughly chop 1 cup of roasted, salted Pistachios. We don’t want the nut whole, and we don’t want flour – so somewhere in between. Add the chopped pistachios to a small bowl. Meanwhile, briefly chop 1 cup of Rolled Oats as well. I used an old coffee grinder and just pulsed a tablespoon or two at a time. Again, we don’t want Oat Flour, just broken up a bit. You could use a food processor as well. Add this to the bowl with the pistachios. Stir in ¼ tsp Salt, ½ tsp Cinnamon, and 1 Tbs Maple Syrup. Mix well. Finally, slice a whole banana and add to the crumb mixture. Using a fork, mash the banana and stir it into the topping. It will eventually form a sticky, crumbly topping that will create a nice crust for our casserole. Crumble the topping onto your sweet potato casserole (I used my fingers). Be sure and cover the entire surface, and then gently mash it down evenly with your fork. Bake in a 350 ° F Oven for 25-30 minutes. Allow it to cool a few minuted before serving. From my home to yours, let me be the first to say Happy Holidays! 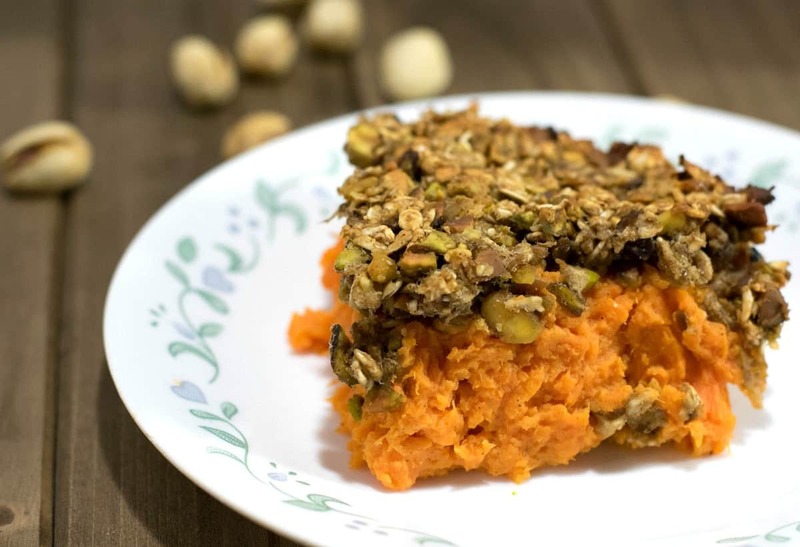 This Vegan Sweet Potato Casserole will definitely grace my table this holiday season. No butter, no oil, no marshmallows, just pure sweet potato happiness. Peel and cube 5 large sweet potatoes and add them to a large pot of cold water. Add a generous pinch of salt, heat to boiling, cook 10 minutes (or until fork tender), drain and return to pan. In a small measuring cup or bowl, whisk almond milk and lemon juice together. Then slowly mix in salt, cinnamon, vanilla, and nutmeg. Pour into potatoes and mash until creamy. Spoon into a casserole dish and smooth out the top. Roughly chop 1 cup of roasted, salted pistachios and place them in a small bowl. Stir in the salt and cinnamon, mix, and then stir in the maple syrup. Mix well. Finally slice a banana and using a fork, mash it into the crumb mixture being sure to incorporate it very well. Mix until there are no dry crumbs left. Carefully crumble the topping onto your casserole, being sure to cover as much of it as possible, and lightly press down with a fork. Tips are always welcome! Thank you for your support! Okay! This will be on my table Thursday and I’m sure everyone will love it. Made this for Thanksgiving and it was delicious! Family mentioned they don’t really like the sweet potato casserole with marshmallows, so this was a nice – and delicious – change! There are April snow/ice showers in Chicago today and we wanted something warm and hearty. 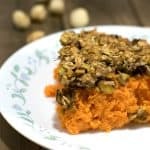 I had cooked some sweet potatoes in the oven last night, so I was excited when I found this recipe. I didn’t have pistachios, so I toasted some walnuts and sunflower seeds. This casserole was fun to make and tastes great. The crispy texture of the topping is a nice contrast to the creamy sweet potato base. Yum! Thanks for the recipe! What could I replace the banana with? Just about to pop it in the oven. It’s not any holiday season, be that as may I went for it. I followed the recipe to a tee, I always do first time around and if it needs any tweaking, I’ll do that later. Any ideas what to serve along with this beauty? My Green beans maybe? Dressing? Oh and don’t forget my brown gravy! I can’t eat nuts. What can I replace the pistachios with? Hi…Bought everything to make this and then noticed that you said people love the salty crunch of pistachios. But the ingredients just listed roasted pistachios so I bought roasted, no=salt pistachios. I hope my guests are disappointed. If they SHOULD be salted, you might want to edit your ingredient list! Thank you. Can this be made the day before, then add the topping the next day? Can you taste the banana in the topping? ?